Mold is a microscopic fungus that can live on animal or plant matter. 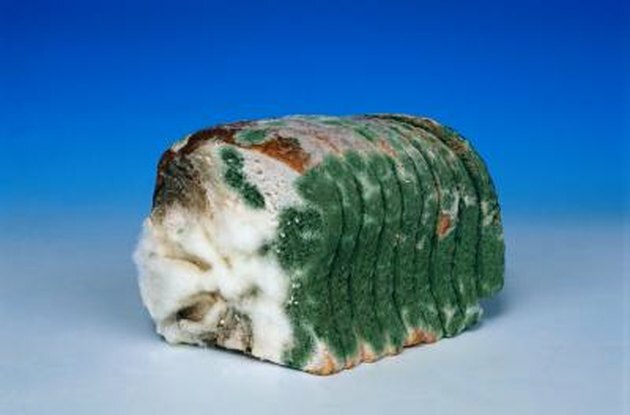 Foods such as bread and cheese often develop mold. Mold is comprised of many different cells and is often visible to the naked eye. Certain types of mold can be dangerous, making those who ingest it sick. Ingesting moldy bread can cause allergic reactions and respiratory problems. Mold consists of root threads that invade food, a stalk that rises above the food it lives on and the formation of spores at the end of the stalk, according to the U.S. Department of Agriculture (USDA). These spores are responsible for the color you see on the moldy food. Do not consume mold on foods like bread. Bread is a porous food and is often contaminated below the surface, where you can't see it. Certain types of mold produce dangerous mycotoxins -- poisonous substances that can make you extremely ill.
Ingesting moldy bread can cause serious respiratory symptoms, especially in those who have asthma or other serious respiratory conditions. Mold ingestion can cause serious and life-threatening complications for asthma sufferers. Allergic reactions are possible in those who are sensitive to mold. Mold does not have to be ingested; sensitive people who sniff mold can have a serious reaction. Some allergic reactions cause anaphylaxis, a life-threatening medical emergency that can cause death if treatment is not sought immediately. Certain types of fungi on foods produce a cancer-causing poison known as aflatoxin. The USDA monitors foods, especially peanuts and field corn, for the presence of this poison.